Very rarely do I travel alone. Or rather, very rarely do I travel alone where I stay at a hotel all by my lonesome. I’ve been fortunate enough to always have a traveling companion or a friend/family member eagerly awaiting me to step off the plane. Even when studying abroad, I made a friend, we met at the airport and experienced the hilarity of our situations as we attempted to find our apartment together. But that will all change come June when I head out to New York. And navigate without a smartphone. Cue the maps. I’ve always had this weird pull to New York, despite not spending much time in the city. As a kid, without knowing exactly what the job entailed, I wanted to be a Broadway producer. It just seemed like the job that would mix a little business with some art. And one I could spend my days completely enthralled with music. My latest stint to NYC was with Amanda last year, though we didn’t really venture north of Midtown. As this trip is happening for a creative recharge, I’m excited to find other ways outside of class to gain some inspiration and insight. A few years ago, I saw this The Sing for Hope piano installation. Pianos are placed throughout the city and available for you to come and play a little tune. And what do you know? They’re back at the beginning of June. So I will step up and play the Ladage Family Staple: The Garbage Man (at least I think that’s what it’s called…) the minute I see one. And last year, I saw this intriguing exhibit in London Rain Room. It’s a room where it’s raining and when you walk in, the rain stops. You essentially control the weather. I’ve been waiting for this exhibit to make its way to the States and it has! Finding its home at MoMA and on exhibit through July. Our classes have us visiting other locations and destinations for keynote addresses and projects, though if there’s a hidden gem, pray do tell! This is just pure awesome, insane and genius. I think it just goes to show, it’s all about the experience. And I can assure you, if I was in this store and a person holding Red Stripe was responsible for this great moment, I too would quickly grab one. Via AdFreak The finished video is below, though the behind-the-scenes is worth a look. Completely loving this tongue and cheek ad from McCann running in today’s Times and London Mail. 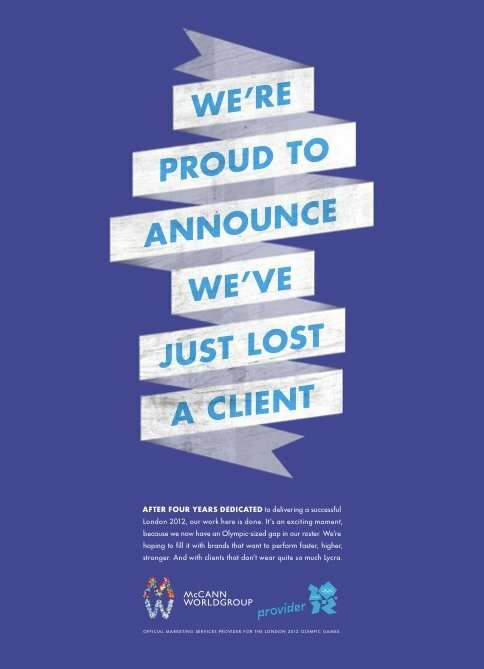 Especially that last line of copy (“And with clients who don’t wear quite so much Lycra”). Way to graciously thank a client for a business while grabbing the attention of the masses. But who’s with me on the depression that’s now happening thanks to the Olympics wrapping? I’ve seen and heard mixed reviews about this past weekend’s Opening Ceremonies. I for one, absolutely loved them. Loved the historical storyline timeline Danny Boyle dreamed up. Loved the bouncing children on trampoline beds (where do I find one?). Loved Mary Poppins dropping in and JK Rowling performing a reading. But just when I thought it wouldn’t get any better, they lit the cauldron. And that my friends, was well worth the time investment to watch. I’ve been counting down the days for the Olympics since the last ones ended. I’m obsessed. And the commercials? Only feed my addiction. Currently loving this one from NIKE that does not feature any athletes. It makes me crave the days of jumping off the high dive–how that was the biggest achievement of the summer and you just felt on top of the world. Heading to a show tonight with The Bowerbirds. But I must say, I’m pumped for their opener Dry the River–a group of five lads from London. I’m a sucker for accents, meaningful lyrics and a violin. Plus the drummer plays with his glasses on. Sold.